One the reasons I like to check out brewery tap rooms is that they often have little specials or little sneak peeks of upcoming attractions. Such was the case last Friday when I dropped by the Hermitage tap room. Their Barrel-Aged Boysenberry Sour Ale will be released this coming Wednesday, December 17th and they’re having a big shindig in the tap room that evening to celebrate. They’ve already bottled and kegged most of it. One bottle had a cosmetic flaw with the wax seal making it unfit for retail, so they were pouring a few samples around the tap room out if it and I snagged one. Hermitage Brand Manager Peter Estaniel gave me the low down on how it was made. “We brewed with 40% wheat, and aged it red and white wine barrels for about 6 months. Both Lactobacillus and Brett (Brettanomyces) were introduced into the barrels, and the boysenberry fruit was added late in fermentation.” Peter went on to tell me there’s plenty of excitement around the brewery on how it turned out. After taking a sampling, I understand the excitement. It’s got a bright, balanced complexity that isn’t muddled, and is an enjoyable sipper. It’s not one of those bracing, puckering sours and the dank, barn-yard funkiness one normally gets with the Brett is way in the background which if you ask me is a good thing. 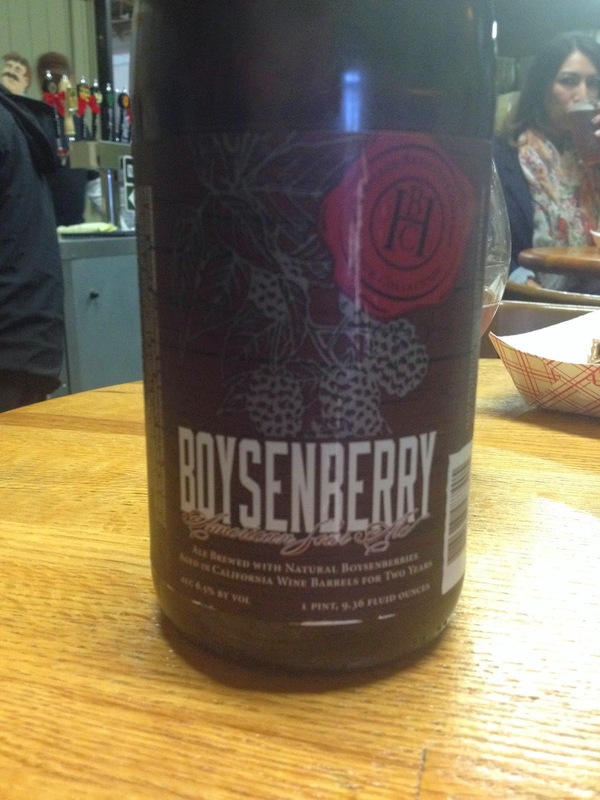 There’s a little wheat tang, a little oak in the mix that works well with the tart boysenberries. If sours aren’t your thing, there’s plenty of other good brews at the Hermitage tap room right now. Such as Hermitage’s Cascade Type 45 Single Hop IPA, part of Hermitage’s single hop series. The Cascade hops give this IPA plenty of piney characters with a little lemon, and I also picked up some tangerine. Next Next post: Is Anderson Valley’s Hightway 128 Gose Better with Blood Orange?